For this workout feature, I’m excited to partner with Katie at Great Lakes Yoga to talk about the benefits of post-natal yoga. I took prenatal yoga at Great Lakes Yoga during my pregnancy with Dylan and really enjoyed my experience. I felt like it was an hour a week that I could sort of get away and relax, take a bit of time for myself and also be with other moms-to-be and talk about our pregnancies and get feedback and support. If you’ve been through a pregnancy, you know how nice it is to be able to chat with other moms about what’s happening and what’s “normal” or just learn about new things, since everyone has a different perspective and experience. If you’re hoping to be a mother one day, it’s something I highly recommend during your pregnancy! After pregnancy, as a new mom, there’s plenty of distractions and never enough time for yourself. I’ve felt that it was great to continue even a brief yoga practice after having Dylan (and I hope to make it a longer and more regular practice this fall), for regaining strength and keeping myself a little more centered and sane amid the craziness. Post-natal yoga focuses on core strength and also de-stressing from the craziness of mom life. Katie was kind enough to share some poses for exactly that and also some other information about yoga in general. What are some of the benefits of doing both pre and post-natal yoga? What are the different focuses of each? There are countless benefits to practicing prenatal & postnatal yoga. Prenatal yoga truly helps mama prepare for the delivery of their baby. Whether it’s a c-section, home birth, v-bac or natural delivery. Prenatal yoga helps get your body and baby in shape to perform the most important job it will ever do – give birth. We prepare by teaching meditation, mindfulness, breathing, strengthening and stretching. It’s a chance for mama to quiet down and pay attention to this amazing time. As a bonus we do a lot of talking and bonding so lots of friendships are born along with the the babes. Postnatal yoga is something most mamas don’t prioritize as much, even though it’s just as important now that baby has arrived. Talk about stress!! We’re talking mental, physical, and emotional adjustments that for the most part are out of our control. What we learn in yoga classes after delivery is how to become less reactive and more observant amongst all this chaos. There’s also a little bit of focus on our egos as we try to get back into our skinny jeans…so we do try and get these new mamas sweating and moving so they can increase their physical health and drop some baby weight. What are some misconceptions about doing yoga that you hear from people? I hear lots of fears about yoga. It’s intimidating, if you’ve never done it. Yes, yoga is complex at first…trying to figure out where to put your hand, which way to twist, it’s intimidating because “everyone will be watching and judging me!” Here’s a little secret…no one is watching you because they are too busy trying to figure it out themselves. Yoga is a practice and it’s NEVER meant to be perfect. It’s also a judgment free and ego free space. All bodies can do yoga and there are modifications for every pose. Don’t worry we will tell you that paschimottadasana is just a seated forward bend. And that if all else fails you can just lay on your mat the entire class! We really don’t judge and have all been there. At the other end of the spectrum we hear that yoga is not hard or won’t be a challenge. Then after class they always tell me how hard it is. I love the humility and honesty after a really juicy yoga class. What is your favorite part about teaching yoga to new moms? I love watching the transformation to becoming a mother. It’s such an amazing journey and I hope to be a sounding board and inspiration. It’s makes me smile when I see moms making themselves a priority. Self worth is a important lesson to show our littles. You offer several types of yoga at Great Lakes Yoga. If someone is new to yoga and wants to try it, where would you recommend that they start? We offer a FREE WEEK to all new yoga students who live in the Great Lakes Bay Region. You don’t need a reservation…there are no sessions for the regular classes at GLY. Just show up with a yoga mat and some water. The Gentle Flow classes and any Candlelight class are appropriate if you’re trying to get your feet wet. They are fully guided and instructed classes which are slowly paced and each pose is thoroughly explained. If you are ready to dive in then a Slowburn or Hot Vinyasa is recommended. These classes have less instruction and are not fully guided. How can readers integrate yoga into their daily lives both inside and away from the studio? We can all breathe and meditate anywhere, anytime. That’s an amazing first step! 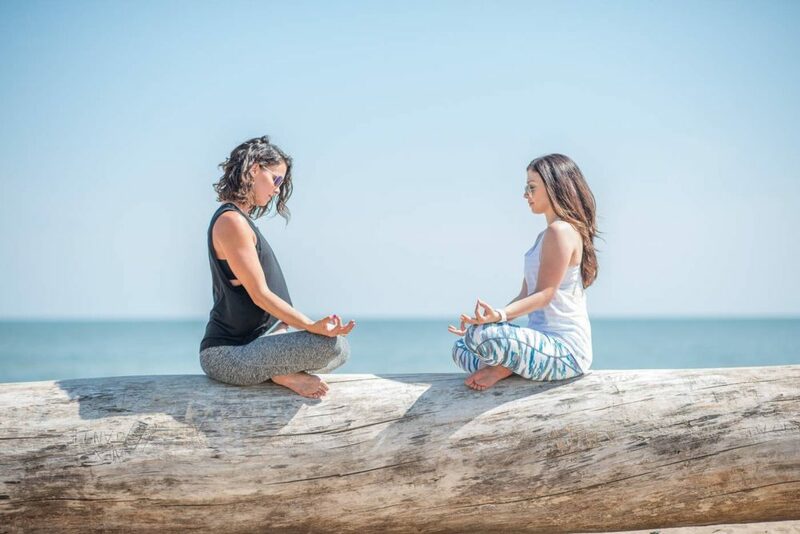 Katie and I met up at the beach a couple of weeks ago to share a few great post-natal yoga poses that you can do anywhere. Whether you just had a baby or not, these poses are great for your core strength and an excellent way to give yoga a try! Tree Pose – Vrksasana: In Tree try to keep the standing leg stick straight. Don’t just place your foot on the inseam of the standing leg…PRESS your foot into the standing leg and push back against the foot. I like to imagine I’m holding my wedding band there! It helps to strengthen the inner thighs and core and helps with balance. Goddess Pose – Utkata Konasana: In Goddess pose try to get as low as possible and tuck your tailbone under your body. Squeeze your thighs like you’ve got a huge beach ball between them. Arms are strong and shoulders squeeze behind you. For an extra push try coming up into your tip toes! This posture works the entire body and it’s beautiful; one of my favorites! Reverse Warrior Pose – Viparita Virabhadrasana: This posture is great for opening up the side body and building strength in the core and legs. Extended Triangle Pose – Utthita Trikonasana: Triangle digs right into the entire body if practiced correctly. Grip the mat with your feet and squeeze in on the thighs. Reach out with the top of your head and open up your chest to the sky. This pose is about stacking the bones…hips and shoulders all in a line. Imagine yourself smashed between two panes of glass. For an extra punch float your bottom hand off the ground and look up at the fingertips. Eagle (Garudasana) Crunches: My personal favorite to spice up any ab routine. Get in eagle on your back. Right elbow wraps under left elbow, wrap arms up with thumbs facing you. Right thigh wraps over top of left thigh, try to curl your toes behind your calf, if possible. Inhale reach hands behind you and touch the ground and feet down to the ground in front of you. As you exhale crunch it up, tapping elbows to knees and chin to chest. 10x then switch to the other side wrapping left elbow under and left thigh on top. As I mentioned at the beginning of this article, I absolutely loved my prenatal yoga experience. I felt that I could even apply the calming breathing to my time in the delivery room with Dylan. I also felt that the exercises we did were beneficial for the pain in my hips and back, and also helped me stay fit during my pregnancy. I did it until I was 38 weeks pregnant (I had Dylan in the middle of week 39) and at that point, it was the only thing I was able to do and I was SO thankful for my classes and the ladies who were in there with me. When it comes to in-studio yoga (and not prenatal), I really enjoy hot yoga classes. I always feel so accomplished and strong when the class is done, along with feeling detoxed from all of the sweating! I was originally pretty intimidated by the idea of a hot yoga class, and I took a lot of breaks in my first few classes. After getting used to it (which didn’t really take very long), I felt like the heat helped me get more into the poses and get a better workout! Out of the studio, I love that I can take yoga with me wherever I am. You can do the above poses on vacation or at home when you have a few minutes! Since I practically live in workout gear these days, I’m always looking for new. I shopped for this outfit on Octer.com, which brings together lots of sites to create a marketplace where you can find several options of what you’re looking for. I used it to shop the Nordstrom sale earlier this month and ended up with this outfit (which, wasn’t actually on sale but was still at great prices!). These wavy print crops (they come in LOTS of other colors) were perfect for beach yoga and this tank is on sale and so light that it’s the perfect top for both in and out of studio yoga practices. I wore it with a white sports bra but I also like the idea of pairing it with a bright colored one to add some more color. I’ve always wanted to try yoga and especially on the beach! This post is so informational! Ps: you seriously look so adorable!! Thanks for sharing this! I’ve always heard how great yoga is for pregnancy. You’re making me glad I signed up for a class tonight! Such an informative post, thanks for sharing! I need to try yoga after baby comes! i definitely had trouble taking “me time” after both of my pregnancies and it’s a real drain on you. yoga is such an amazing way to take care of yourself after a baby. great post! LOVE doing yoga on the beach! And your outfit!!! Maybe I would enjoy yoga more if I did it on the beach, looks so pretty. Such a huge fan of yoga! I’ve never thought about the amazing benefits it would provide while pregnant, I’ll have to remember that! Love this post! I had no idea what the benefits were! I’m not post-natal, but I just might do this yoga practice this morning justbecause!